"Oscar II" redirects here. For the submarine class, see Oscar class submarine. For the Swedish navy ship, see HSwMS Oscar II. For the amateur satellite, see OSCAR 2. Oscar II (Oscar Fredrik; 21 January 1829 – 8 December 1907) was King of Sweden from 1872 until his death, and the last Bernadotte King of Norway from 1872 until his dethronement in 1905. Oscar was king during a time when Sweden was undergoing a period of industrialization and rapid technological progress. His reign also saw the gradual decline of the Union of Sweden and Norway, which culminated in its dissolution in 1905. He was subsequently succeeded as King of Norway by his grandnephew Prince Carl of Denmark under the regnal name Haakon VII, and as King of Sweden by his eldest son, Gustaf V.
Harald V, the present king of Norway, is a great-grandson of Oscar II, through his third son Prince Carl, Duke of Västergötland. Oscar Fredrik was born in Stockholm on 21 January 1829, the third of four sons of Crown Prince Oscar and Josephine of Leuchtenberg. Upon his birth, he was created Duke of Östergötland. During his childhood he was placed in the care of the royal governess countess Christina Ulrika Taube. He entered the navy at the age of eleven, and was appointed junior lieutenant in July 1845. Later he studied at Uppsala University, where he distinguished himself in mathematics. On 13 December 1848, he was made an honorary member of the Royal Swedish Academy of Sciences. 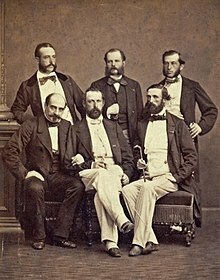 In 1859, Oscar became heir-presumptive to the thrones of Sweden and Norway, as his eldest brother King Charles XV & IV was without legitimate heirs, having lost his only son to pneumonia in 1854. Oscar's middle brother, Gustaf, had died of typhoid fever in 1852. Oscar assumed the thrones on 18 September 1872, upon the death of Charles XV. At his accession he adopted as his motto Brödrafolkens väl / Broderfolkenes Vel ("The Welfare of the Brother Peoples"). While the King and the Royal Court resided mostly in Sweden, Oscar made the effort of learning to be fluent in Norwegian and from the very beginning realized the essential difficulties in the maintenance of the union between the two countries. The political events which led up to the peaceful dissolution of the union between Norway and Sweden in 1905 could hardly have been attained but for the tact and patience of the king himself. He was dethroned on 7 June 1905 by the Storting and renounced the Norwegian throne on 26 October. He declined, indeed, to permit any prince of his house to become king of Norway, but better relations between the two countries were restored before his death. Oscar II died in Stockholm on 8 December 1907 at 9:10 am. His acute intelligence and his aloofness from the dynastic considerations affecting most European sovereigns (both of his grandfathers were French military commanders who served under Napoleon) gave the king considerable weight as an arbitrator in international questions. At the request of Great Britain, Germany and the United States in 1889 he appointed the Chief Justice of Samoa under the Treaty of Berlin, and he was again called on to arbitrate in Samoan affairs in 1899. In 1897 he was empowered to appoint a fifth arbitrator if necessary in the Venezuelan dispute, and he was called on to act as umpire in the Anglo-American arbitration treaty that was quashed by the United States Senate. He won many friends in the United Kingdom by his outspoken and generous support of Britain at the time of the Second Boer War (1899–1902), expressed in a declaration printed in The Times of 2 May 1900, when continental opinion was almost universally hostile. He remained a strong supporter of the Navy throughout his life, and frequently visited ships of the fleet. When the coastal defence ship Oscar II was launched, he even signed his name on the vessel's aft main gun tower. The office of prime minister was instituted in 1876. Louis De Geer became the first head of government in Sweden to use this title. The most known and powerful first minister of the Crown during the reign of Oscar was the conservative estate owner Erik Gustaf Boström. Boström served as Prime Minister in 1891–1900 and 1902–1905. He was trusted and respected by the king, who had much difficulty approving someone else as prime minister. Over a period of time, the king gave Boström a free hand to select his own ministers without much royal involvement. It was an arrangement (unintentionally by both the King and Boström) that furthered the road to parliamentarism. King Oscar II in full regalia – he was the last crowned Swedish king and was known to enjoy the pomp and ceremony. A distinguished writer and musical amateur himself, King Oscar proved a generous friend of learning, and did much to encourage the development of education throughout his dominions. In 1858 a collection of his lyrical and narrative poems, Memorials of the Swedish Fleet, published anonymously, obtained the second prize of the Swedish Academy. His "Contributions to the Military History of Sweden in the Years 1711, 1712, 1713", originally appeared in the Annals of the Academy, and were printed separately in 1865. His works, which included his speeches, translations of Herder's Cid and Goethe's Torquato Tasso, and a play, Castle Cronberg, were collected in two volumes in 1875–76, and a larger edition, in three volumes, appeared in 1885–88. His Easter hymn and some other of his poems are familiar throughout the Scandinavian countries. His memoirs of Charles XII of Sweden were translated into English in 1879. In 1881 he founded the world's first open-air museum at his summer residence near Christiania, now Oslo. In 1885 he published his Address to the Academy of Music, and a translation of one of his essays on music appeared in Literature in May 1900. He had a valuable collection of printed and manuscript music, which was readily accessible to the historical student of music. Being a theater lover, he commissioned a new opera house to be built by Axel Anderberg for the Royal Swedish Opera which was inaugurated on 19 September 1898. It is until today the current home of that institution. Oscar II told Henrik Ibsen that his Ghosts was "not a good play". As he was dying, he requested that the theatres not be closed on account of his death. His wishes were respected. King Oscar II was an enthusiast of Arctic exploration. Along with Swedish millionaire Oscar Dickson and Russian magnate Aleksandr Mikhaylovich Sibiryakov, he was the patron of a number of pioneering Arctic expeditions in the 1800s. 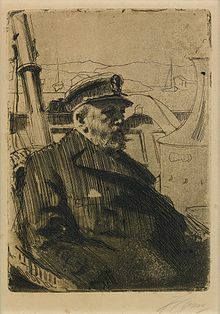 Among the ventures the king sponsored, the most important are Adolf Erik Nordenskiöld's explorations to the Russian Arctic and Greenland, and Fridtjof Nansen's Polar journey on the Fram. The name and portrait of Oscar II have been used as a trademark for King Oscar sardines (which remains the only brand to obtain his "royal permission") as well as for gingerbread cookies (pepparkakor) and other bakery products made by Göteborgs Kex AB. Oscar was also a generous sponsor of the sciences, particularly mathematics. He set up a contest, on the occasion of his 60th birthday, for "an important discovery in the realm of higher mathematical analysis". His eldest son, Oscar Gustaf Adolf, Duke of Värmland, succeeded him as King Gustaf V of Sweden. His second son, Oscar, renounced his succession rights upon his marriage in 1888 to Ebba Munck af Fulkila, and was given the title of Prince Bernadotte first in Sweden and from 1892 in Luxembourg, where he also was created Count of Wisborg. The king's other sons were Carl, Duke of Västergötland, who married Princess Ingeborg of Denmark; and Eugén, Duke of Närke, who was well known as an artist. Oscar II, unlike his father, never officially recognized any illegitimate children of his. 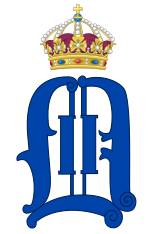 Wikimedia Commons has media related to Oscar II of Sweden. ^ "Death Of Oscar King Of Sweden. His Son Ascends The Throne And Takes The Title Gustave The Fifth". The New York Times. 9 December 1907. He Eulogizes His Father Tells Why The Country Should Cherish His Memory. In His Sentiments All Sweden Shares. ^ Borgenstam, Curt (2017). "Swedish Coastal Defence Ship Oscar II" (PDF). International Navy Journal. 5 (1): 65. ISSN 2411-3204. ^ Aho, Maire (January 1999), "AE Nordenskiöld Collection included in the Unesco Memory of the World Program", Tietolinja News, FI: Helsinki, archived from the original on 7 July 2007 . ^ King Oscar’s Prize. Springer. ^ The solution of the n-body problem, Florin Diacu. Mar 2016. ^ Anna Hofmann – varietéstjärna och filmregissör, catalogue of exhibition by that name at Stockholms Stadsmuséum 1998 with essays by Åke Abrahamsson and Marika Lagercrantz/Lotte Wellton. ^ Norlin, Arne (2015). Familjen Bernadotte: makten, myterna, människorna (in Swedish). Stockholm: Fischer & Co. pp. 218–220. ISBN 9789186597962. LIBRIS 17803399. ^ Sandberg, Mattias (24 May 2010). "Jakten på den försvunne sonen". Aftonbladet (in Swedish). Retrieved 4 May 2016. ^ "The Order of the Norwegian Lion", The Royal House of Norway. Retrieved 10 August 2018. This article incorporates text from a publication now in the public domain: Chisholm, Hugh, ed. (1911). "Oscar II." . Encyclopædia Britannica. 20 (11th ed.). Cambridge University Press. p. 346. Cronholm, Neander N. (1902). A History of Sweden from the Earliest Times to the Present Day. Chicago, New York [etc.] The author. pp. 301–10. "Oscar II." . The American Cyclopædia. 1879. "Oscar II, Frederic" . The New Student's Reference Work . 1914. This page was last edited on 18 January 2019, at 15:13 (UTC).